I make these rolls pretty much every time I make Vietnamese, which is a lot. A well-known fact about me is that love Asian food, pretty much all Asian with Chinese takeout style as the exception. When it is nice out, I like to head to Chinatown to discover new and exciting produce/dried seafood stuff/weird sauces pretty much Zimmern type things. I love cooking with fish sauce and recently have been researching on all the different kinds out there. If you are using it in a recipe, it really changes the flavors so it is important to stick to one kind that you like. I prefer Vietnamese fish sauce over Thai. Since there are tons of brands just look for ones that have “nhi” or “thuong hang” in the title. Also, make sure it is a light amber color instead of dark. Cook noodles in boiling water per package instructions, about 3 minutes, then rinse under cool water. After dipping your rice paper in warm water, lay wrapper onto your dry work surface. 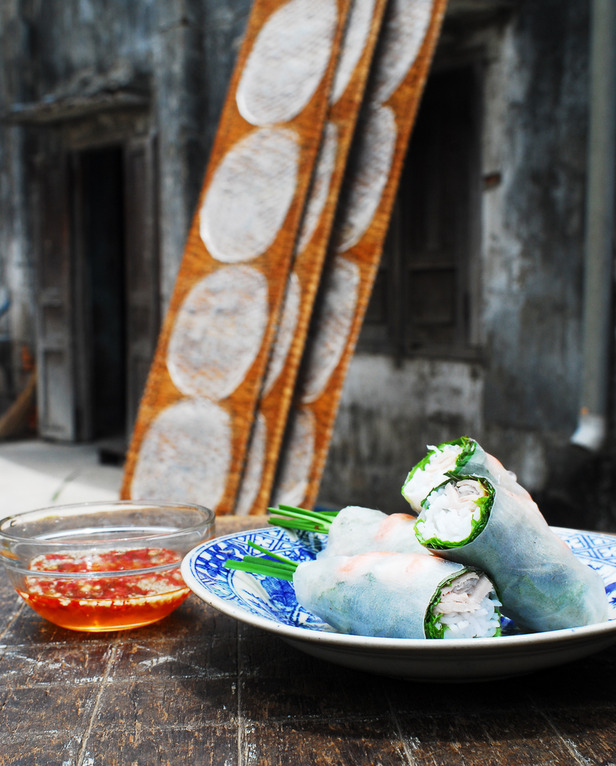 Allow rice paper to soak up water and become soft and pliable (about 30 seconds to 1 minute) before you start to roll. Layer with a small amount of shrimp, noodles herbs, and lettuce. Layer your filling ingredients on the edge of the wrapper closest to you, shrimp first. I like to drizzle a little hoison sauce and siracha over the fillings. To form the roll, first fold the sides into the center over the filling, then fold and roll, just before you complete the roll add 2 pieces of garlic chives so that they stick out at one end. For dipping sauce just combine all ingredients together in a small bowl.